Is the Universe Expanding or Contracting? Neither, states Time's Paradigm. Is the Universe Expanding or Contracting? This philosophy of science paper entitled TIME'S PARADIGM explores time and our perception of existence. Read the core proposal, Universal Contraction, below. recent work doubts the validity of such a claim." Universal Contraction - the proposal. There are some who have suggested that we may not have evolved from a 'Big Bang', that Hubble's Red Shift can be expressed by other means, that mass is increasing or that we just don't know enough to be certain the Universe is expanding. We know Albert Einstein, himself, had difficulty with an expanding universe. So, too, have later influential scientists, such as Dirac, voiced their concerns. Is the Universe shrinking, or is it expanding? Most cosmologists are pretty much resigned to the fact that our Universe is expanding. That was their education and their right of passage. They may be right. However, there is growing concern that they may not be. The evidence for contraction is compelling. From matter in collapse giving the impression of an expanding universe, to those that argue a Big Bang is fundamentally inconsistent with our laws of physics. The underlying reasons for these hypothesises is surely not to discredit earlier postulates, but simply to expand our knowledge and reach. Time is a vast subject encompassing many disciplines. This paper, Time's Paradigm, is an in-depth study engaging all; not just physics, but predominantly psychology and our perception of reality. For simplicity, the core postulate of this paper is expressed below, however, for an overview of the entire article and a Table of Contents, please visit the Home Page. It is well understood that bodies with relativistic speeds will experience a shortening of distances and a reduction in the rate of their clock readings relative to others, observing only that the speed of light (c) holds true and constant. However, this does cause some confusion for those wishing to conceptualise how known standards can warp by such extremes. Human perception is baffled by such abnormalities. We find it hard to accept that a distance can be measured to be different by different observers, that the space between objects can shrink at will while time appears to be quite flexible. This is particularly the case because we do not reside, as far as we are aware, in an inertial frame of reference travelling at any great velocity. Regardless, distances and times should remain true, unquestionable constants, but they don't. “Bodies in the Universe are in constant and uniform collapse by an amount inversely related to their velocities”. That bodies of mass are reducing or contracting relative to their velocities, rather than the standard view that says, mass increases with velocity, does not constitute a conflict with SR. Observers with slower speeds contract at a greater rate. They measure those with greater speeds as increasing in mass due to slower contraction, indicative of SR. It can be argued that SR does not say we increase in mass, i.e. get bigger, because that really makes no sense; so, to avoid such an apparent incongruity, the increase in mass was given a special name: Relativistic Mass. UC states that there is no actual increase in mass at high speed, we merely slow contraction. Distances, time and lengths can now be seen to change physically and differently dependent on an observers relative speed. At speeds approaching (c), a body will practically cease contraction and observable surroundings in faster contraction will thus be measured from the reference frame of the body to have distances and lengths reduced by an amount as expressed by the Lorentz factor. However, bodies at relativistic speed would not actually be able to perceive slower frames of reference in contraction. 1. Bodies in the Universe are subject to overall contraction. The greater a body's velocity, the more it resists collapse. 2. At (c), all energy is uni-directional, and particulate functionality at the atomic level is deprived and ceases, as does collapse. 3. Contraction of matter in the Universe is a measure of functionality, the faster a body contracts the faster its clock ticks. At zero velocity (z), particulate energy is absolute, with no interference from progression through space to hinder total collapse. 4. Distances between bodies are proportionally reduced by the contraction of matter. Space exists only between matter and, therefore, is not infinite. It is contained in all directions due the cyclical nature of the Universe. 5. The Universe is neither expanding nor contracting. Its contents is collapsing towards the future, while it appears to be expanding. In this model the past and the future exist together (the Block Universe), as a solid fractal progression. 6. All matter emerges into existence in the Universe at (c), called their 'Universal Origin'. 7. The spatial dimensions of matter merge to redundancy at (z), called a 'Singular State'. 8. (c) and (z) are both attributes of the same event. At (z) a singular state will re-emerge as uni-dimensional matter at (c). The overall energy of the Universe remains constant, and time is shown to function as a cycle. 9. The universal contraction of matter and, therefore, time, is a cycle which flows in one direction only. Both time and space, and thus acceleration, are commonly measured on linear scales. However, linear measurements preclude progress along their lengths. They have finite ends which, as such, cannot be reached, and from which uncertainty, and so motion, is denied. 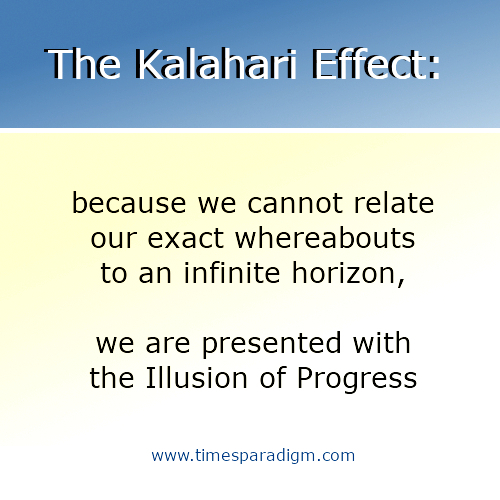 Cyclical processes allow progress by eliminating finite points. Universal Contraction of matter states that time and space are cyclical, there was no beginning of time and existence, there was no Big Bang. Time is now given a place of significance. Motion is no longer a guiding principle. Bodies, which previously were only thought to have freedom of movement in three dimensions, can now be understood to flow in contraction through all three simultaneously, thus progressing in a fourth. This paper strongly advocates a static universe, block theory, where physical motion is the illusion and progress is only in time. By accepting a cyclical function for time, we do away with a beginning and an end, we contain energy, we dispense with innumerable constants and infinities, and we can study all aspects of our existence under one umbrella. The notion that the entire contents of our Universe is in contraction may, in itself, be confounding to some. The favoured view is that our Universe is expanding. That is indeed the case, but while it appears to be expanding in three dimensional observation, it is also contracting through a so far unobserved fourth, time. Read Abstract, for a brief outline of arguments. Or, peruse this Summary, for a more detailed introduction to the entire paper.